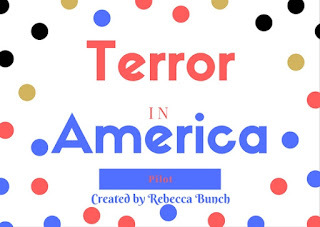 TERROR IN AMERICA is one of The TV Ratings Guide's first ORIGINAL SERIES, an original feature ONLY on The TV Ratings Guide. Four political leaders are gathered on the steps of the US Senate for a press conference, leading to speculation about the nature of said press conference. Garry: Something is up today in Washington, as four of the country’s most well-known leaders are holding a press conference today. It is unknown what today’s press conference is about, or if it is even notable at all. However, it is rare for so many leaders especially this group, to have a join press conference, especially when the nation is seemingly at peace. It is about to begin, so we’ll cut to North Dakota Democrat and Speaker of the House, Samuel McGovern. Samuel: Hello my fellow Americans. As I’m sure you are all aware, this is a landmark year for this country. This year, the United States turns a quarter-millennia old. I know that the media likes to determine whether things are a “big deal” or not and if they’re worth our attention. Well I can assure you, this is a really big deal. This should be a day of celebration for this country. All of us here is Washington want to make sure that this is a day that will go down in history for this nation. About three weeks ago, Vice President DeFazio came to be with a plan to commemorate this date. I brought the idea to Senator Young and Secretary Engleton, and we decided to plan this event as a group. I’ll let the Vice President tell you about it. Francis DeFazio: This country can always use a way to come together, and we have planned what I believe to be the largest-ever celebration in the history of this country. All across the nation, in eight different states and eight different cities, we will have fireworks displays and grand celebrations. The entire cities will be decorated in festive decor. Concerts, performed by some of the most notable artists of today, will be planned. These will be two-night events, with a grand countdown to 250 on July 3rd and an all-out bash on July 4th. It’s going to be an incredible event that you won’t want to miss. I’ll now pass this over to Senator Young to give some specifics. Bill Young: This is going to be an event like no other. In Philadelphia, Pennsylvania, I will be hosting the celebration, which will include a performance by Pennsylvania-bred band The Kicks. In Boston, Massachusetts, Senator Nora Winchester will host their celebration, which includes a regal tea party, taking the city back to its early roots. In New Orleans, Louisiana, Vice President DeFazio will host a jazz festival. The Orlando celebration will be hosted by Secretary of State Harvey Engleton, and will feature events inspired by the city’s great theme parks. A celebration in Minneapolis, Minnesota will be hosted by Governor Trina Mears, and will provide a tribute to their beloved Vikings and the NFL. A star-studded event will take place in Los Angeles, California, to be hosted by House Speaker McGovern. In Houston, Texas, Secretary of Defense Jim Spier will host a tribute to the Wild West. And finally, and still very importantly, in Las Vegas, Nevada, Representative Didi Marks will oversee a tribute to the partying atmosphere of Las Vegas, inspired by its world-famous shows and casinos. Now to Secretary of State Engleton with some final details. Harvey: All of these are great American cites, and these are great pieces of Americana. We are proud to share these planned celebrations with all of the country. Thank you and God Bless America! Garry: That was certainly less of a big deal then we thought, but this is still a major piece of news. And you heard it here first! Meanwhile, leader Matthew Rice and other members of the DUSC terrorist organization are watching from their headquarters in Caper, Wyoming. Matthew: You see, this is why I gathered you all here today. I’ve known about this for about a week due to our tech wizard, Duke. Duke hacked into McGovern’s computer and got all the plans for this. A fellow DUSC member, Donovan, speaks up. Donovan: It’s a Fourth of July celebration. What do you want us to do? Matthew: You heard them. It’s the largest celebration ever in this country. So we’re going to attack it. Blow it up. Shoot the leaders. Kill everyone in sight. Donovan: That sounds nice, but how are we actually going to do it. Matthew: It will be tough. But I have a carefully laid plan that Ash and I have worked on all week. Ash, tell ‘em. Ash: Well you see. This is a suicide mission for whoever steps up. You won’t make it out alive. Nobody is required to do this mission, it is anyone’s choice. However, DUSC would appreciate it. Donovan: We’re the leaders, none of us are doing it. Ash: I know, this is just the only pitch I wrote. Donovan: Well, skip this part. Ash: Anyway, we have some Secret Service members that are members, and they’ve been assigned to the events. We got lucky there. This will get us more intel and will help us make a sneak attack. Our main targets are the four main planners here: McGovern, Young, DeFazio and Engleton. They’re the most influential men in the country short of the president. And based on our calculations, the president won’t be able to retain control of Congress with the panic, leading to our takeover while they scramble. Donovan: That sounds good, but what is the plan here? Ash: Well, we have the “Secret Service” hook up a hidden bomb, and have it go off right at midnight. Seconds before, have one DUSC member shoot each host, ensuring their deaths. Have another DUSC member firing into the crowd from a distance. Have them shoot everyone possible. The more deaths, the better. Donovan: This is a good plan. Just don’t go blabbing about it. We have to keep it a secret. This can not get out. Matthew: That’s the plan. Now if you excuse me, I have to phone the boys on the inside. We have to tell them so they can prepare. Back on Capitol Hill, the celebration’s leaders are planning even more. Bill: This is going to be the greatest celebration in American History. The festivities are going to be amazing. Francis: What about security? We all know what happened last New Year’s Eve. Samuel: I have no doubt that some terrorist group will plan a bombing or something. Just like the New Year’s Eve bombing that killed twenty people. Harvey: We’ll keep everyone safe. This isn’t a problem. Security is top-notch. Just then, General George Fredericks, one of the military’s most widely respected leaders, barges in. What did you think of the episode? Comment your thoughts below and catch a new episode next week!